Aziz Ahmad first asked for permission to jump off Menara Kuala Lumpur in 1999 and it was given. The dream of KL Tower International BASE Jump came alive. KL Tower International BASE Jump has come a long way since its inception. The first BASE Jump in Malaysia was Sunday, 3rd October 1999 at Menara Kuala Lumpur. The event was one of the highlights of Menara Kuala Lumpur’s 3rd Anniversary celebrations. This event is listed in the Malaysia Book of Records as the first Malaysian BASE Jump. Participants were Capt. Abdul Rahmat Omar, Lt. Aziz Ahmad and Martin Dumas, a Canadian. They jumped off the broadcast part of the Tower Head at Level TH05 from a height of 300 meters. On 1st February 2001, Malaysia and the world witnessed the first big BASE jumping event organised at Menara Kuala Lumpur. Dennis McGlynn, Avery Badenhop and Harry Parker of the International Pro BASE Circuit (IPBC) were contracted to organised this BASE jumping event. 50 BASE jumpers from around the world were invited to participate. It took place in conjunction with Federal Territory Day celebrations in Kuala Lumpur. Malaysia was the first country in the world to host such a big BASE jumping event off a building. 434 jumps were completed during this event. The event gained recognition around the world and BASE jumping fraternity. The Menara Alor Star International Jump 2002 was held on 31st January 2002, which coincided with the Sultan of Kedah's birthday celebrations. The KL International Tower Jump 2002 was held on 3rd February 2002 in conjunction with the City Day Celebrations. The entire exercise was well received. Both the jumps achieved their objectives with the number of participants and the extensive media coverage. Over 40 BASE jumpers from all over the world participated. Menara Kuala Lumpur first participated in the International Championship of Extreme Skydive / World BASE Cup 2002. The event took place from 28th December 2002 to 5th January 2003 and was organized by MIXSA - Malaysia International Extreme Skydive Association. 57 participants from 16 countries took part in the event. Menara KL was selected as a venue for the Aerial Acrobatics category, which is the world's first championship ever held of that kind. In 2003 Menara KL again took part in International Championship of Xtreme Skydive / World BASE Cup. This event included Petronas Twin Towers for the accuracy part of the competition and KL Tower as the venue for the aerial acrobatics category. The event took place from 28th December 2003 to 5th January 2004. 43 competitors from around the world participated. After skipping the traditional KL Tower BASE jumping event in 2003, Menara KL continued with its international tower jump event in 2004 at both Kuala Lumpur and Alor Setar Towers. The event was extended to have 2 days of jumping at KL Tower and 2 days at at Alor Setar Tower. Over 40 BASE jumpers from around the world participated in the event. KL International Tower Jump 2004 was held on 13th & 14th March followed by Alor Setar International Tower Jump 2004 on 17th and 18th March. In 2005 the previous organisers of Dennis McGlynn, Avery Badenhop and Harry Parker gave up continuing to organise the event due to the last minute nature of how things are done in Malaysia. They did a really wonderful job of organising past events and it was a shame to lose them. Taking over organising the event in 2005 was President of Malaysian BASE Association, Aziz Ahmad and President of Australian BASE Association, Gary Cunningham. Aziz was the founder of the event and has been an integral part of the event since its inception. Gary had attended all KL Tower Jump events since 2001 and usually completed the most BASE jumps at each event. Kuala Lumpur International Tower Jump 2005 was extended to be 3 days at Alor Setar Tower and 2 days at KL Tower. Alor Setar International Tower Jump 2005 was held on 23th-25th September where 300 BASE jumps were complete by 12 BASE jumpers. KL International Tower Jump 2005 was held on 1st and 2nd October where 650 BASE jumps were completed by 46 BASE jumpers. On 31st December 2005, Australian BASE jumper Gary Cunningham set the world record at KL Tower for the most BASE jumps done in 24 hours. He completed 133 jumps. Gary was assisted by a team of 12 people packing his parachutes. With the continued success of events, Malaysia had proved itself as world leader at hosting BASE jumping events. It was now time to step up to an even higher level. Malaysia became the first country to host a BASE jumping event which included 5 different buildings. The event ran from 12th - 27th August 2006. The event attracted 68 BASE jumpers from around the world. Over 1880 BASE jumps were completed during the event. The 2007 event saw 98 BASE jumpers from 18 countries join Malaysia in its golden celebration commemorating 50 years of independence or merdeka. The event was held over 3 weeks from 8th to 26th August and included 6 buildings in 5 different states of Malaysia. 2780 jumps were completed during the event. After after the huge effort BASE organiser Gary Cunningham put into organising the biggest and best event in 2007, he was replaced in 2008 when he refused to invite problematic BASE jumper Amanda Vicharelli back to the event after her efforts to undermine the previous two events. Menara KL CEO unexplainably thought it would be a good idea to hire Amanda and a couple of her friends Stephan Muller and Jojo Rose to organise the event instead. The lead up to the event predictably did now go well and the Menara KL CEO experienced for himself how problematic and incapable his new organisers were. They failed to get any BASE jumpers to come to the event for the full tour of buildings and very few wanted to come to KL Tower. After realising what a big mistake he had made, Menara KL CEO terminated his new BASE organisers from their positions a month before the event started. To salvage the event it turned into more of a training camp for 10 relatively inexperienced Malaysian BASE jumpers who were given the opportunity to hone their skills BASE jumping off buildings throughout Malaysia. Feeling vindicated, previous organiser Gary Cunningham was the only foreign BASE jumper to attend the full tour of buildings. 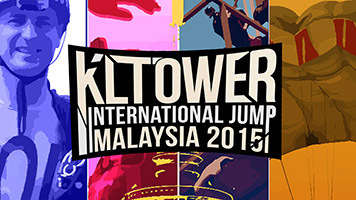 40 International jumpers attended the event at KL Tower. The event was over 4 weeks from 3rd to 31st August and included 6 buildings in 5 different states of Malaysia. Over 1200 jumps were completed during the event. The 2009 event took place from 3rd to 25th October. This year Menara KL fully organised the event themselves. They slashed BASE jumping experience entry requirements by a factor of 10 in a desperate attempt to lurer more BASE jumpers back to the event. This was seen as a high risk and irresponsible move by Menara KL staff who showed they had no real understanding about BASE jumping. The event was advertised with a few buildings that it was well know Menara KL was not welcome back to after the fiasco the previous year. These buildings were replaced at the last minute with lower buildings that were higher risk. The event included 8 buildings in 6 different states of Malaysia. A new CEO was appointed to KL Tower a couple of months before the the 2009 event was due to start. The event was allowed to go ahead but was scaled back to just KL Tower and also an unofficial event at Alor Setar Tower. It was fully organised again by Menara KL in the same high risk fashion as the previous year with no real BASE jumping experience requirements. The focus seemed to be on maximising the number of participants without any real care if participants were capable or not. The event took place from 28th September to 10th October. This year saw the first fatality in the 10 year history of the event. The incident happened on the first day of jumping at Alor Setar Tower and sadly it was a female BASE jump with only 20 BASE jumps. The event continued at KL Tower with noticeably many very inexperienced BASE jumpers jumping in a reckless manner with a few near death experiences. Experienced BASE jumpers were disappointed to see what was once a world leading event be so mismanaged and decay in such a way. KL Tower BASE Jump 2011 took place from from 29th September to 2nd October, coinciding with the 15th Anniversary of KL Tower. It took place at KL Tower only. It included 4 days and 2 nights of BASE jumping off KL Tower. Malaysian events management company CD Events were brought back in to organise the event as they did from 2001 to 2004. While BASE jumping organisers Aziz Ahmad of Malaysian BASE Association and Gary Cunningham of Australian BASE Association were also hired to bring back high standards and order to the event, as they previously did from 2005 to 2007. Gary was a world leader at building display BASE jumps having completed over 1300 building display BASE jumps of his total 2300 BASE jumps at the time. KL Tower BASE Jump 2012 took place from from 27th to 30th September. It included 4 days and 2 nights of BASE jumping off KL Tower. 91 BASE jumpers from 17 countries completed over 2200 BASE jumps during the event. This year we had a special launch platform built so BASE jumpers could take a running launch. There was also the added bonus of exiting from the crane on top of KL Tower. Some say this was the best event ever. BASE Jumping Organiser: Gary Cunningham, President of Australian BASE Association. KL Tower BASE Jump 2013 took place from from 27th to 30th September. It included 4 days and 3 nights of BASE jumping off KL Tower. 101 BASE jumpers from 20 countries completed over 2860 BASE jumps during the event. Ground Coordinator: Aziz Ahmad, President of Malaysian BASE Association. KL Tower BASE Jump 2014 took place from from 26th to 29th September. 108 BASE jumpers from 20 countries completed over 3200 BASE jumps during the event. KL Tower BASE Jump 2015 took place from 2nd to 4th october. It included 3 days and 2 nights of BASE jumping off KL Tower. 117 BASE jumpers from 26 countries completed 3481 BASE jumps during the event. KL Tower BASE Jump 2016 took place from from 30th September to 3rd October. 116 BASE jumpers from 26 countries completed 3074 BASE jumps during the event. KL Tower BASE Jump 2017 took place from from 29th September to 2nd October. 102 BASE jumpers from 22 countries completed 3067 BASE jumps during the event.